Salted Capers Jagog waterfalls, Unique Phenomenon Nambung Beach in Lombok- On the coast of Nambung, Hamlet Village Pengantap Buwun mas Sekotong Lombok-West Subdistrict, there is a natural phenomenon that is very unique. Nambung Beach nicknamed "Cape Jagog" this large coral rock-filled tub of Green Canyon abroad there. A row of rocks of the high coral when it swept by a huge wave coming from the East side of the South would form a panorama of nature which is cool. Buffeting waves come to rock it's going to look like a waterfall. Nambung Beach in southern Lombok Island, bordered by the choppy Indian Ocean Beach and large rolls. This later led to some point on the ocean border location a priority place surfing or surfing, less safe for swimming or snorkeling with the family and kids. However, with its contents which are more populated by large fish and monsters, the location of the waters of the Gulf in this section are also often the purpose of fishing and catch a fish the fishermen fishing outside of Lombok. 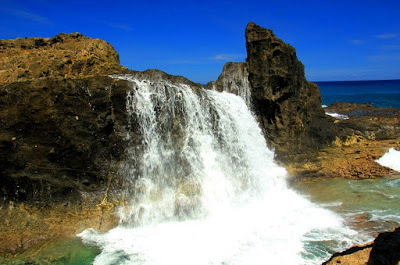 Nambung beach with his Salty Waterfall in Cape Jagog is now one of the tourist destinations of Lombok that begins to recognize foreign as well as local travelers. 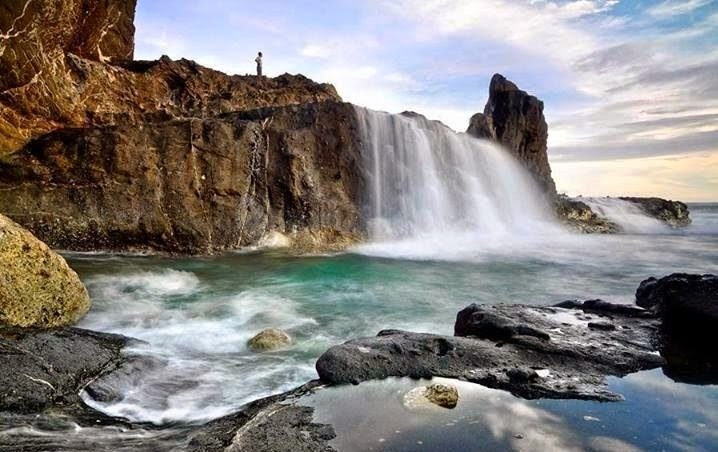 A crashing wave followed by a decline in seawater in the coral rocks and cliffs as high as 10 meters, presents a view of the stunning waterfalls, Waterfalls flow Saltly is almost similar to view waterfalls Thread or Yarn Stokel Netting in Central Lombok area there. The beauty of the Waterfalls of Cape Jagog is often teased the hearts of its visitors to immortalize the moment – the moment that beautiful, but my advice is do not once once try to pamper themselves at the bottom of the waterfall flow just for the sake of a documentation cool or just a test of guts, because some time ago a teenage visitor who tried to test the guts under the flow of water plunge it suffered a shoulder injury a broken backbone because not by window falls to the rocks. Coastal views of white sandy beaches such as pepper you can also find this place, as shore Nambung is still in line with the region which is the Beach, the beach or Beach Mawun Selong Mullet in central Lombok there. In addition to the oceans turn blue with beautiful mountain views of the mountain edges, Coastal Nambung is also still a new tourist destinations are categorized in Lombok, comfort, hospitality, natural that impressed the locals, or facilities General facilities a rather difficult this place you meet, even for just a parking you have to leave their vehicles at home houses surrounding it. To get to the Waterfall Beach Nambung, should you wear your own vehicle or use the charter transportation services around the region Gerung. If the starting point is the city of Mataram, you need more or less 2.5 hours to reach Shore Nambun the, route from Mataram then headed Gerung and continues to Harbor toward the sheet. At the t-junction Segenter (sheet) you turn left toward route Sekotong region. If arriving in Sekotong Tengah (marked with the police Sector Sekotong before the t-junction), upon arrival at the t-junction turn left Sekotong, you will go through Gulf line the quiet about 8 km with access roads already paved is nice. After passing the incline and derivatives along a 2 km towards the deserted Bay, straight course at the t-junction Buwun Mas Market as far as 4 km to the East. Along the 1 km before reaching the coast of Nambung you will presented with a beautiful beach view on the right side of the road with some gili in the Center. All the way from the Bay to the beach Deserted Nambung is indeed impressed a little quiet, but not to worry, this area is quite safe even though menyisiri bebukitan and beach-side ledges with a kind of Mangrove trees. Arriving at a corner with a view of the Hill and uphill, you will see a signboard bearing the simple Beach Nambung made by citizens. Drop by in house residents and ask the location of Cape Jagog, you can parked your vehicle at home houses or in public parking lot that was already provided. walk as far as 500 meters of white sand and rocks were combing the shores to witness this beautiful natural phenomenon. Be careful passing through bebatuannya, because in addition to the slick rocks is also a bit sharp. If less sure to walk by yourself, find a simple hut closest to the waterfall, an old fisherman named Mr. Clean would love to help you towards a waterfall salty Cape Jagog. To get a view of the waterfall are terrific, my advice come in the range of hours 10.00 am to 03.00 hours in the afternoon, because when the sea water receded then volume waves come and shape the flow of the waterfall will be less or even nothing at all. For the choice of accommodation or hotels around the place is not there yet, but you can choose some of the best hotels in the West including the Sekotong Cocotinus Sekotong, Krisna Bungalows, Villa Yukie and others.